Be the first to review this 2019 Honda Odyssey. i have enjoy this vehicle. The Honda Odyssey was completely redesigned for the 2018 model year. The updates brought the minivan much closer to its main competitor, the Chrysler Pacifica. The Pacifica may be more elegant, but the Odyssey rivals it in almost every category, with excellent power, space, technology, comfort, driving dynamics, and fuel efficiency. It hasn’t been changed for 2019. The Odyssey’s standard equipment list reads like a wish list for parents, starting with seating for eight passengers. The EX, just one step up from the base LX, presents a compelling value, especially with standard Honda Sensing safety equipment. Honda’s Magic Slide second-row seats are available in EX models and above, which offer four different seating configurations including the ability to remove seats that aren’t in use to increase cargo space. Leather and navigation are nice options, but they can be lived without. Same with things like heated/cooled seats, heated steering wheel, hands-free tailgate, and an 11-speaker sound system. Up in the Touring and Elite models, there are features such as in-car cameras and microphones to make conversation between rows easier. The Odyssey is powered by Honda’s refined 3.5-liter V-6, paired to a smooth-shifting 9-speed or 10-speed automatic transmission. With 280 horsepower, this engine can smoothly and easily propel a full load of people and their stuff at a fast freeway pace. All Odyssey minivans are EPA-rated at 19 mpg city, 28 highway, 22 combined. That’s as good as it gets for an eight-passenger vehicle, thanks to standard cylinder deactivation that shuts down three of the six cylinders under light load. The 10-speed automatic transmission uses start/stop technology that shuts the engine off at red lights. The Odyssey isn’t the only family hauler that reaches 22 mpg, however. The Chrysler Pacifica matches that, while its hybrid version gets even more. The Honda Pilot rates 22 mpg in most configurations, and the front-wheel-drive Toyota Sienna also gets 22 mpg. 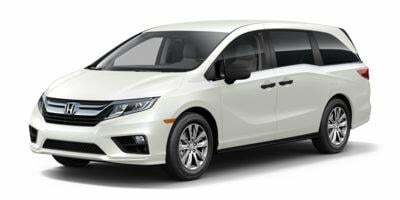 Crash-test ratings for the 2019 Honda Odyssey aren’t totally complete, but the NHTSA gives this year’s Odyssey a five-star overall score, including four stars in the calculated rollover resistance test. The IIHS rated the Odyssey as a Top Safety Pick after it earned top “Good” scores in all tests and a “Superior” rating for its automatic emergency braking. Top trims, Touring and Elite, get headlights rated as “Acceptable” by the IIHS. Standard safety equipment in the base LX includes three-row curtain side airbags with rollover sensors, driver and front passenger knee airbags, and a rearview camera. All other models, which Honda says is 95 percent of all Odysseys, add forward-collision warnings with automatic emergency braking, lane-departure warnings and active lane control, road departure mitigation, adaptive cruise control, automatic high beams, and blind-spot monitors with rear cross-traffic alerts. The 2019 Odyssey is available in 6 trim levels: LX, EX, EX-L, EX-L with Navigation and RES (rear entertainment system), Elite, and Touring. EX models ($34,060) add Magic Slide to the second row seats, LED daytime running lights, tri-zone automatic climate control, power 12-way drivers seat, auto-locking doors with proximity sensors and blind spot monitors, Apple CarPlay and Android Auto compatibility, upgraded 160-watt audio system, HD radio, and remote start. The range-topping Elite ($46,970) gets an 11-speaker audio system, wireless phone charging, heated steering wheel, heated and cooled front seats, ambient lighting, rain-sensing wipers, power-folding exterior mirrors, and 19-inch wheels. The Odyssey has presence, with its chrome beltline suggesting a bolt of lightning. However, it’s not the prettiest minivan in the parking lot. That would be the Chrysler Pacifica. The face of the Odyssey shows a family resemblance to the Pilot crossover and Civic sedan. Behind the big chrome grille there are shutters to improve the aerodynamics and increase fuel mileage a bit; at the edges of the grille there are LED running lamps. LED headlights and fog lights come on the Touring model. There is a deep swoop carved into the front and side doors. The channels for the sliding rear doors are relocated under the third-row glass, to better conceal them. A chrome-bar design in the rear matches that in the front, and is framed by LED taillamps. The center console is massive, functional if not pretty, with two main storage areas, one of them deep and the other wide and flat. There’s a digital instrument display and clear touchscreen on the dash. The 4G LTE WiFi hotspot can drive the rear entertainment system, while there is a wireless charging pad for smartphones, Apple CarPlay and Android Auto. With its many configurations, you can custom tune the Odyssey to be what you need for each trip, project or adventure. Honda’s Magic Slide seating system in the rear features a second row composed of three sculpted and roomy seats that can be moved separately. With just the middle seat removed, it’s like captain’s chairs. Four kids with that setup is perfect, but it can carry eight when needed. If what you need is a flat floor and cargo space, you remove the second-row seats that weigh 70 pounds each, and store them in your garage, or somewhere. It’s not as convenient as the Chrysler Pacifica’s Stow GÇÿN Go system, which has rear seats that fold flat into the floor. But if you do get those seats out of there, the Odyssey has the most cargo space in the class, 144.9 cubic feet–and 86.6 cubic feet of that is behind the second row. That’s with the third row folded flat, which it easily does with a tug on a strap. Behind the third row there’s still 32.8 cubic feet, which is twice the size of a trunk of a full-sized sedan. And the third row can actually fit an adult. The rear seat entertainment system uses 10-inch screens with 4G LTE, with apps like PBS Kids, iHeart Radio, Spotify, and more. There’s even an app called "How Much Farther," that maps the van’s path to the destination. Another app allows passengers to use their smartphones to control their entertainment screens and climate control, and send music to the sound system and destinations to the navigation system. The Odyssey rides with stability, and smoothness. The electric power steering is quick and controlled. It feels more like a confident crossover than a lumbering minivan. It’s more connected to the road than a minivan is expected to be. The ride still isn’t as smooth as a Pacifica. The 3.5-liter V-6 engine makes 280 horsepower, which is 32 hp more than before, so it’s faster; the Odyssey seems quicker than the Pacifica. The 10-speed automatic transmission is much better than the 9-speed. The 10-speed shifts smoothly and responsively, and uses all 10 gears seamlessly. Only the Touring and Elite models get the 10-speed. The Honda Odyssey has an excellent interior and performance. If you don’t buy a Touring or Elite, you’ll miss the sharp 10-speed transmission, but you’ll still have the smooth power and fuel mileage of the V-6. We like the value of the EX, especially its safety technology.